(Manila, Philippines) This year’s Cobra Ironman 70.3 Philippinesended with a bang inAugust atits second-time host location in Lapu-Lapu, Cebu City.A successful turnout of over 2,000 athletes from across six continents and 35 countriestested their minds, bodies, and spirits to the limit in a continuous1.9km swim, 90km bike, and 21.1km run. And since its first arrival in 2009, it has been the biggestand most highly anticipated premium-sporting event to land on Philippine shores. Although it has only been a few weeks since the last participant crossed the finish line, the Cobra Ironman 70.3 Philippines is now opening the registration for the 2014 race. Starting October 1, athletes can start logging on to www.ironman703phil.com to secure race slots. 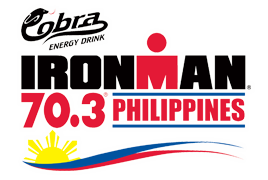 Last year, the slots were filled up four days after registration opened, and the Cobra Ironman 70.3 Philippines team expects the same, if not more,registrants for the 2014 race. Cobra Energy Drink has been powering the biggest race of endurance for five years straight. The brand is the race’s biggest supporter, on hand every step of the wayto sustain the energy needed to endure the race. Some of the world’s best athletes like Courtney Atkinson dominated this year’s men’s pro category,besting all other local and international athletes with his 3:58:07 race time. Coming in on second place was three-time Cobra Ironman 70.3 Philippines winner Peter Jacobs with a 3:59:09 time; while David Dellow placed third with a 4:02:22 finish. Leading the women’s pro race was Caroline Steffen,finishing with a 4:16:12 time, while 2012’s defending champion Belinda Granger came in second at4:33:50, and Bree Wee completed the podium with her highest time of 4:27:49.Meanwhile,Philippine pride, four-time Filipino women’s elite champion and professional triathlete, Monica Torres, finished fifth with at4:52:02. There are different reasons why athletes challenge themselves to finish the Ironman; some do it for a healthy lifestyle, others to test their endurance, and there are those who do it for their advocacies. This biggest triathlon race has been known as well to attract local celebrities and icons. Joining this year’s relay competition was Apl D Ap of the international group, Black Eyed Peas, who biked for 90km for his advocacy for the education of the poor. Another highlight was cancer patient, Manny Angeles,who was diagnosed with Non-Hodgkin Lymphoma in 2005. With only the goal of taking home a Cobonpue medal, Angeles came in 9 minutes after the cutoff, in triumph knowing he can finish despite his illness.